All posts written during/on my time in San Diego. It’s been a while since my last post and a lot has happened since. I’ve had my first solo and a couple more since. I’ve also had some progress tests and started flying cross country. Of course I also had my birthday! My roommates had a nice surprise for me. When I woke up, they had decorated the house and had put up Post-It’s all over the place, congratulating me with my birthday. Later that day, they even had a present for me! They really gave me a nice birthday. Two days later is was time for my first solo! It was so much fun! First I did 3 touch-and-go’s with my instructor and then I dropped him of at the parking, where a lot of the other students were standing and took off on my own. When I landed for the third time, it was time to pick up my instructor again and taxi back to SAA. That’s when it was time for traditions; first I got my tie cut and was carried out to the car, because you’re not allowed to touch the ground after your solo. I was driven back to the apartments in the trunk of the car to get thrown in the pool there. After drinking a beer in the pool I was allowed to get out and touch the ground again. Wouter filmed my solo and I compiled a short movie from it. On my photo page, I also uploaded some new picture. My first solo was also my last flight with Johan as my instructor, I now have a new one: Niclas. He’s a lot of fun with to fly with and it’s nice to get a new perspective on (my) flying. With Niclas I did my second solo, which was again half with and half without instructor. Since then I’ve gone up a couple of more time (completely) solo. Unfortunately the winds weren’t good today. There was too much turbulence (or chop in this case) to go up solo. So now I’ll be going solo on Friday or Saturday. I’ll keep you posted! For now I’m hitting the books again. First let me tell you about the G1000-test. After our solo’s, we go into the cross country-phase, where we have to fly longer distances to other airports. We don’t do that in a conventional Cessna 172 (like the picture on one of my previous posts), but we fly G1000 (or Cessna 172 NAV III as the airplanes are called officially). Those airplanes have a (Garmin) G1000 glass cockpit (like on the picture at the top), so you get a lot more and a lot more accurate information. Since you can (or should) not fly an airplane without knowing how the systems work, we had some lessons on the different parts and possible malfunctions of the G1000 system, followed by a test. That was pretty interesting, and very reassuring to see all the redundancy incorporated into the airplane. I passed the test with 95%, making just one mistake by not reading well enough. So that was just me being stupid. Later this week I’ll be starting to fly the G1000-airplanes (on my birthday). But first I have my FIRST SOLO flight! That will be tomorrow. In the last 2 weeks I’ve had some extra lessons, to get the landings right. But then during my stage check (the flight with a stage check instructor, to see if I was ready to solo) it once again didn’t go so well on my landings, so I had to do another lesson. The rest of the stage check went very well though, so I only had to redo the landings. On Thursday I had one more lesson with Johan (and Roland from the CAA in Sweden in the back). Since the stage check instructors had the weekend of, I was supposed to fly with Nicolas, my flight instructor for phase 2, on Saturday, so I could continue to fly. One of the stage check instructors, however, did work on Saturday after all and the decision was made to go up with her instead, this time being safe enough on my landing to go solo! So tomorrow is supposed to be a big day! I hope the weather will be good enough, because Wouter has seen his first solo cancelled twice, due to bad weather… So everybody keep your fingers crossed for nice weather (and nice landings)! By the end of this week, we’ll also have our first progress test for the ATPL theory, and the week after 2 more. So hopefully that’ll go well. So it’s a lot of studying this week and a few flights. Somewhere in between I hope I’ll also be able to celebrate my birthday a little bit. So for now it’s into the books! The last week has been a lot of studying and a lot of flying. By now I’m getting a picture of how much studying goes into becoming a pilot. I spend most of my days either studying or flying. But it’s not that bad actually. The subjects are really interesting! I’m learning about the weather, about parts of the aircraft and about the human body and mind. The flying really helps to get your through, though! It really reminds me of why I’m here, every time I go up. Last time I posted, my solo was coming up very fast, but that has slowed down a bit. I haven’t been up alone yet. My landings weren’t really going as well as they should and so Johan, my instructor, and I both agreed an extra lesson would be best. This extra lesson turned into 2 lessons, but on Thursday I’m scheduled to have my Stage Check. If that goes well, the first flight after should be my solo flight! I have also had my first airplane malfunction. The flaps (shown in the picture) on an aircraft are used to fly slower than you would normally do, especially useful for landing a plane. They are also used for slow flight. When I was practicing slow flight with my instructors, they flaps stayed extended, so we had to fly back to the airport very slowly… It was a harmless failure of the aircraft, so that was good. For the rest not much has happened, but hopefully my next post bring news (and pictures) of my first solo flight! Well, my first week of ATPL theory ground school is over. It’s been a lot of work, trying to get everything read and viewing all of the digital material. In the mean while I have been flying some more, getting closer and closer to my first solo. The ATPL theory we have to do this phase is Meteorology (MET), Airframes, Systems & Power plants (ASP) and Human Performance and Limitations (HPL). So by the end of the next 2 months, I’ll be a meteorologist, an engineer and a doctor/psychologist. Not bad… But then again, I probably won’t. But I will get a better understanding of weather, airplanes and the human body/psyche. For example, I now know that the earth’s atmosphere is divided into the Troposphere, Stratosphere, Mesosphere, Thermosphere and the Exosphere. I also know how the brakes on an aircraft work and what brake fade is (it is bad!) and I have learned that the worst case scenario for everything having to do with your circulatory and your respiratory system is that’s you’ll end up “dead” (yes, “dead”!). It’s actually pretty interesting to learn all this stuff, some of which falls in to the “duh”-category and other stuff being pretty hard to grasp. Try getting the influence of pressure and temperature on the working of your altimeter right, every question you get about it. Is a lot harder than it seems… I have also found a lot of benefit in my former job, being a camera man for LectureNet at the Utrecht University. All the hours I’ve spend recording medical lectures, have paid off. I have a better understanding of the heart and lungs because of it, than a pilot needs. So thank you Martin, for all those hours in the UMC! This week I only had 2 hours of flight. I did my basic instrument flying and I practiced emergencies some more. The basic instrument flying consists of flying solely on your instruments. You get a giant plastic cap, called a “hood” on, and you have to maintain or acquire a certain altitude and heading. It’s pretty fun, but hard when you have to communicate with ATC, while climbing an turning at the same time. Women pilots are definitely at an advantage there! Flying back to Gillespie, my instructor pulled the throttle to idle (like releasing the gas pedal in a car) and told me to make the landing with power. Planes apparently glide further than I thought, because half way through the runway, I was still way above and had to do a go-around. 5 extra minutes in the air! Last week has been mostly about tests and touch-and-go’s. I’ve been spending a lot of time in the books this last week, but I also spend 3 hours in the air. To finish my PPL ground school, I first had to get 90% on 3 tests, to allow me to make the LaserGrade test. That’s the official FAA ground school tests. We had a few chances to get those three 90’s, but luckily I got them the first time around. Then I had to do more studying for my LaserGrade and for my pre-solo oral. My pre-solo oral, was an oral exam to see if I know enough about flying and about the rules of flying, to perform solo flights. I passed the oral with 5 out of 5! I was pretty nervous for the oral, so I was really glad that I passed so well! Afterwards we had our communications test, to see if we knew how to talk to ATC. I passed that one with only 2 mistakes, so that was pretty good as well. Then I decided to take my LaserGrade, just to get it over and done with. (The moment to take that test is not fixed, so you can do it whenever you have all the papers needed). That went pretty good as well; I only made 1 mistake on it! Afterwards I spend about an hour waiting for my ground school instructor, as he made to tiny mistakes in my endorsements. So he had to print and sign new ones, or I could get in trouble by the time I have my check ride for the PPL. The flying this week was mostly about landing and flying traffic patterns (a rectangular flight path from take-off to landing). It’s been nice to do a lot of landings and take-offs, since especially landing a plane is pretty hard. But I am getting better at it, and my instructor told me he was even starting to feel safe. I also trained on what to do in case of an engine failure during flight, so I know what to do if it ever happens. Now I have an entire weekend off, so that’s nice! I probably will be starting the preparations for my ATPL theory though. Ground school for that starts the upcoming week. Hopefully I’ll also get a few more flights in next week, because then I might have my first solo flight the week after already! If that’s the case, I’ll tell you in my next update. For now I’m going to enjoy the weather! But I’ve made up for those hours by now, yesterday I had two flight lessons combined and this morning I had another one, giving me a total of 10 hours of flight by now. Since my first solo is supposed to be somewhere around my 20th lesson (and approximately my 20th hour of flight) I’m already half way there! We’ve been doing stall practices (view this video if you have no idea what I just wrote: Stalls) and traffic patterns (circles around an airport), which includes practicing landings, which is still pretty hard. But I’m getting better at it. This week I go the chance fly to other airports than Gillespie. I’ve been to Brown , which is South of SD just across the border from Tijuana, Mexico. Yesterday we flew north over the coast of San Diego (which is really nice to see from above!) to Palomar. I also got to fly pretty close to Miramar MCAS (made famous by the movie Top Gun). At Brown, I landed next to the Goodyear Blimp, which was also pretty cool. Unfortunately I need 2 hands to fly, so no pictures though. At the same time the last week was filled with (preparing for) tests. Last monday we had a technical test on the plane we’re flying, the Cessna 172, to see if we know how to use the manual and if we get how it works. I aced that test, so after last week’s fail, that was really nice! Next week we’ll be getting 3 more tests on the PPL Theory, to see if we are ready for the official test, called LaserGrade. 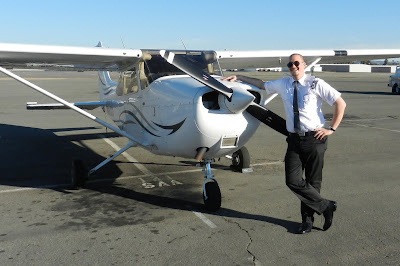 You need to passed that test in order to get an FAA Private Pilot License. But first we have 3 tests, which we have to pass with a score of at least 90%. So the rest of the weekend I’ll mostly be studying the questions, to make sure I don’t have to do any of the tests again. This week I’m also supposed to get my pre-solo oral exam, which is an exam to find out if I know enough about flying and the aircraft, to allow me to go solo. So it’s all going really fast, but I’m still enjoying it very much! The last two weeks my grandpa has been in the hospital, but I heard he’s still getting my blog printed and delivered to him. So a special message for him: Rest well and hopefully you’ll have speedy recovery! Well, that’s all for now. I’ll try to write another post next weekend, after all the tests are done. And for everybody in Brabant (and Limburg): Alaaf! Enjoy carnaval! It’s been 2,5 weeks since my last post and time just keeps on flying. The first ground school tests have come and gone, my logbook has 6 flights in it and that number is increasing rapidly. We said goodbye to the 11-1 class, they’re off to Sweden. Wouter and I are now the only 2 Dutchies left here. Luckily we also have 3 Belgians to talk Dutch with and some Swedes to teach us how to pronounce Göteburg and Västerås the right (and some other words, which I will not be putting on my blog). We’ve been in ground school almost every day of the week, for the last couple of weeks. We’ve done 2 out of the 3 stages in PPL(Private Pilot License) theory we need to study before we can start thinking about getting our FAA PPL, the first license we’ll be getting here. After both of the stages, we had to do a stage exam. The first was no problem: 92%, so an immediate pass. The second one caused to more trouble/frustration. I failed it at first, scoring only 76%. This was my lesson in how to prepare for a test in flight school. Because all tests in aviation are compiled out of the same database, you need to study all the questions in this database and repeat them untill you can select the right anwser without thinking about it. Having learned how to play the game, by failing the first time, I passed the exam 2 days later with 96%. In a week’s time, we’ll be doing the final stage exam, and then we need to prepare for the official test (called Lasergrade) by scoring at least 90% on 3 practice exams. So I will be studying a lot more questions the next couple of days. (or as it called over here: “Clicking”, because you use your mouse to answer the questions). Since my TSA approval has come in, I’ve been spending a lot of time flying as well. In less then 2 weeks, I’ve had over 6 hours of flight training. The flying is going better and better. I’ve actually done my first real landing (with some directions from my instructor). There is still a lot more I need to learn, before I can fly solo, but I’m improving every lesson and enjoying it as much as I can. Every flight is a reminder of why I’m here. We also got our uniforms, unfortunately we’ll need to do some more flying before we get any stripes on our shoulders, let alone a wing on our chest. But it’s a start. This is me in my uniform, next to one of the planes I’m flying. I’ve added some more pictures from the last couple of weeks to my photo album. Just go to my Picasa album (or the Photo page on my blog) to check them out. Well, I’m off to do some more studying. Probably by the pool, because it’s nice and warm here! So, catch you guys later! Last Friday at 5:45am I left Bunnik with Willemijn and Tristan to pick up my parents to go to Schiphol Airport. At Schiphol we met up with Wouter and his parents, and after Wouter and I checked-in, we went for a coffee before going to customs and getting to our gate. The flight from Amsterdam to Houston when pretty smooth, I spend a lot of time sleeping, so that speeded things up. In Houston it took a while to get through Immigrations, but the advantage was that our bags were waiting for us when we got through. Clearing customs was done in a sec and even the security check was pretty swift. So after immigrations it all went pretty smooth! And, I ate my first American hamburger in a while at Wendy’s. The flight from Houston to San Diego was a little turbulent, but wasn’t too bad. We landed 15 minutes early, but because we were in one of the last rows, it took forever to get off the plane. After that it was through some halls, down some stairs to wait for our bags and after that it was out the doors. We spend about 15 minutes waiting for our driver to show up, but since we were 15 minutes early, that was pretty well timed! Greg, the driver, brought us from San Diego Airport tot El Cajon, the small city just North East of San Diego, where we live and where our school is. Even though it was dark, Greg took us on a little tour of the neighborhood, so we knew where to get our groceries and stuff, the next day. After the little tour, Greg dropped us off at our apartment and there we met Anessa, a Taiwanese girl with whom we share our apartment. And Wouter and I got settled in to our room. The Dutch students from the class 11-1 and the Belgians of class 11-3 (we ourselves are class 11-4) came over to introduce themselves and after a while we went over to the apartment of class 11-1, where they had some food ready for us. They had cooked burritos for us, just like it had been done for them, when they arrived. After spending some time getting to know them and hearing all sorts of stories about studying here at the SAA, it was getting late and we were pretty tired, so we went back to our apartments, only to be wide awake again at 6:00am. Ain’t jetlag just fun…? But, we had a lot to do yesterday, so it wasn’t that bad. We did our first shopping and got some food, a toaster, American cell phones and some other stuff. My American phone number is +1-619-368-0214. Since I now have an American phone, my Dutch one will stay at home most of the times. In the evening Bert and Matthijs (from 11-1) and Judith (from 11-3) took us to Barona Casino, a huge casino 30 minutes from El Cajon. They always wanted to go there, because apparently you do a lot of flying over that building and they wanted to see the inside. We had a great dinner and drank some beers, but we left the gambling up to the other people. Today we did some more grocery shopping and the rest of the day we’ll be doing very little, as tomorrow we will start our introduction week and we want to be rested. Talk to you guys again soon!